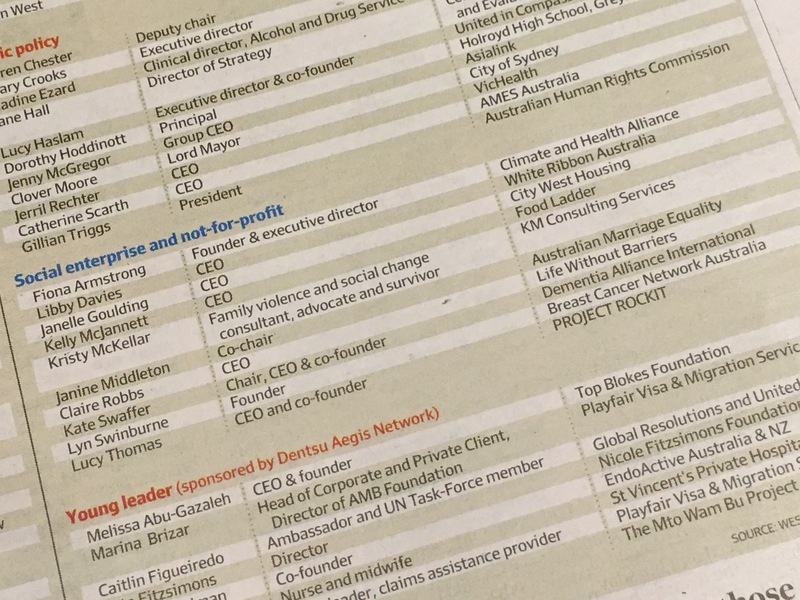 Newsflash: I am truly thrilled to be able to announce that yesterday I was listed in the 2016 list of 100 Women of Influence in Australia, in the SOCIAL ENTERPRISE & NOT-FOR-PROFIT category. The category winners and overall winner will be announced during an event to be held in the Sydney Town Hall on 27 October 2016. So many are deserving of being recognised for their work, and I am extremely proud to be a part of this remarkable group of Australian woman of influence. In saying that, the work of others is just as remarkable, and I am proud of all women and men, especially those who despite great personal adversity or serious health issues, continue to work to support others. Congratulations Kate, well deserved. Thinking of all in S A at this difficult time. Hope all your family O K .
Thank you Evelyn… it is calm today, but apparently we are in for more devastating storms and flooding! Congratulations dear Kate. Such a deserving person for this recognition. Well done Kate I’ll send you song from Willie later. Congratulations, Kate! It is wonderful that you are being honored in this way. Congratulations Kate and so richly deserved! Huge congratulations Kate – so well deserved!! Congratulations Kate – a wonderful testament to your energy, courage and love, plus hope for all those affected by a dementia diagnosis. Thank you so much for all you are doing. You influential person you. Congratulations galore. Hoping your staying safe and dry down in SA. Kate, that is such an honor. Doing what you do for the benefit of others is such an unselfish act. You share so much awareness and educate as you go along. You are so worthy of this honor. Congratulations Kate Swaffter on being recognised for your work advocating for people living with the disAbility of a dementia. Its great to be recognised for the difference you are making. Well done. Kate Lambert, CEO, Daughterly Care.